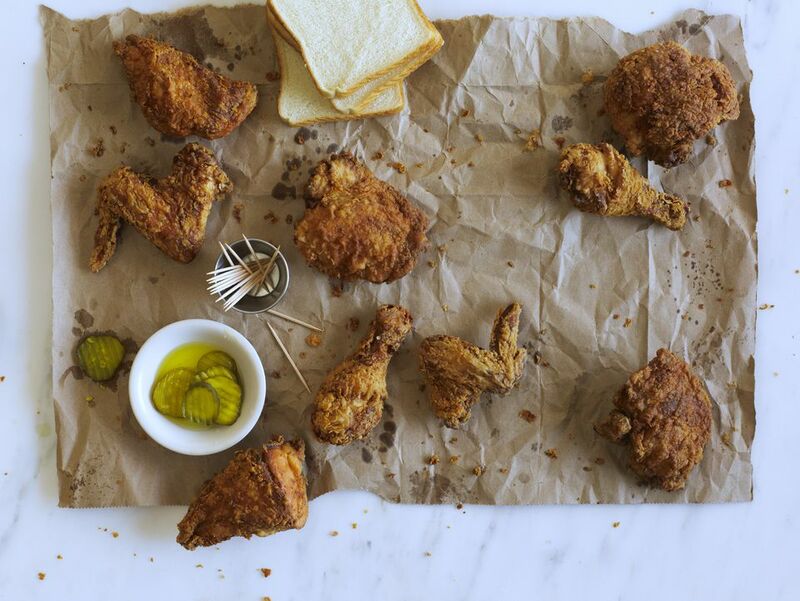 Try making some of this delicious fried chicken for yourself. You can always pan-fried it instead of deep-frying if you want. This can easily be doubled or tripled for dinner on the first go around and the next day's picnic fare. Thoroughly mix marinade ingredients in a zippered plastic bag, add chicken, and refrigerate 12 - 24 hours, turning occasionally to ensure coverage. If you're in a hurry, you can skip the delay and simply dip the chicken in the marinade and then proceed to step 3 but chances are it's not going to be as juicy. Mix coating ingredients in a zippered plastic bag and shake well. Empty into a deep bowl or square baking dish. Remove chicken from marinade, shake off excess marinade, then dredge in coating. Set chicken aside on a plate and allow to rest for 30 minutes in a refrigerator. Heat 1/2 to 1 inch of oil in a medium, straight-sided, lidded skillet over medium-high heat. Once oil is hot, re-dredge chicken in coating, shake off excess and add to skillet (skin-side down). Cook for four minutes or until a light golden brown. Turn chicken over, reduce temperature to low, cover and cook 15 to 20 minutes more. Ideally, cook until an instant-read thermometer registers 150 F for breasts or 155 F for thighs. Remove cover, increase heat to medium-high, and turn over again. Cook another 5 minutes until coating is crisp and mahogany brown. Drain on a plate on paper towels or drying racks above tinfoil lined baking sheets. Stick with either breasts or thighs that are the same size to assure equal cooking times. If doubling recipe, cook in two batches to avoid over-crowding or use a large to very large skillet. Although cast iron is widely lauded as the skillet of choice for pan-fried chicken, we find stainless steel or aluminum work better. Cast iron is slow to heat and slow to cool and you really want a quicker response when you turn the burner down and up.